At present, no published evidence is available on the effectiveness of the DOTS (directly observed treatment, short-course) strategy in reducing the incidence of tuberculosis (TB) within a country in the European “hot spots”. The present study aimed to demonstrate the effectiveness of the strategy implementation in reversing the epidemiological TB trend in Romania based on programmatic data analysis. Key programme indicators were analysed from 1998 to 2007, and included DOTS coverage, case-detection rate, treatment success and overall incidence of notified cases. Internationally agreed definitions were used. The key programme indicators began declining and the World Health Assembly targets were reached (79% case-detection of new sputum-smear positive cases and 85.5% success rate in new culture-positive TB cases), 7 yrs after initiation of the DOTS expansion. The success story in Romania suggests that other middle-income, high-incidence countries (i.e. those belonging to the former Soviet Union) might be able to reach the World Health Assembly Targets and curb the burden of tuberculosis. Tuberculosis (TB) control is based on rapid diagnosis and effective treatment of infectious, sputum smear-positive (SSP) cases, and is aimed at breaking the chain of transmission and preventing selection of resistant mutants 1. In the early 1990s, the World Health Organization (WHO), after recognising that TB is a global emergency, advocated the global adoption of the DOTS (directly observed treatment, short-course) strategy. The DOTS strategy, which consists of five key elements (government commitment, diagnosis through bacteriology, standardised and supervised treatment, uninterrupted drug supply, and regular programme monitoring), proved to be one of the most cost-effective strategies ever initiated 1. Moreover, in order to achieve the World Health Assembly targets (WAT; e.g. 70% detection of SSP-TB cases and 85% successful treatment of cases) and the TB-related Millenium Development Goal (a steady decline in TB incidence) 1, 2, WHO developed a broader approach that is embodied in the new Stop TB Strategy 1. The Stop TB Strategy consists of the following six elements: 1) pursue high-quality DOTS expansion and enhancement; 2) address TB/HIV, multidrug-resistant (MDR)-TB and other challenges; 3) contribute to health system strengthening; 4) engage all care providers; 5) empower people with TB, and communities; and 6) enable and promote research. The new Stop TB Strategy incorporates all the principles of the DOTS strategy (as the first element), while offering further new elements (patient support, quality diagnosis and treatment for all patients, including MDR-TB, extensively drug-resistant-TB and TB/HIV co-infected cases), and is represented by all care providers, who are essential to improving TB control in difficult settings 3, 4. Although evidence on the successful implementation of DOTS in Asia and Latin America exists 5, its long-term effectiveness was recently questioned 6. To date, no published evidence is available on the effectiveness of DOTS in reducing the incidence of TB within countries in the European “hot spots”. Over the past 20 yrs, Romania has been reported to have one of the highest adult TB rates in the whole of Europe; from 1995 to 2007 >23,000 cases·yr−1 were recorded, which corresponds to >100 TB cases per 100,000 population 7, 8. The aim of the present study was to demonstrate the effectiveness of the DOTS strategy implementation in reversing the epidemiological TB trend in Romania, based on programmatic data analysis. The DOTS strategy was implemented in Romania building on the experience that had been gained in the pilot projects of Iasi County (Romania), where a protocol based on WHO recommendations (DOTS Strategy) was developed 1, 2, 8. Surveillance data were collected using a computerised data-collection programme, based on Fox-Pro, which connected external units with the national Surveillance Unit at Marius Nasta Institute (Bucharest, Romania). The individual nominal data included all Eurosurveillance-recommended variables 9, 10. Confidentiality was ensured by coding all names of the data-set according to Romanian legislation. The following key programme indicators were analysed from 1998 to 2007: 1) DOTS coverage (proportion of the total population served by the strategy); 2) case-detection rate (as estimated by the National TB Programme and validated by WHO 7); 3) treatment success (the sum of cured cases, e.g. with evidence of bacteriological conversion at the end of treatment, and achieving treatment completion, e.g. having taken >80% of the prescribed doses) 2, 4, 7; and 4) the overall incidence of notified cases, new SSP cases, new culture positive cases, relapses, children (aged <14 yrs) and the case-fatality rate per 100,000 population. Internationally agreed WHO definitions were used 2, 4, 7. The DOTS strategy was implemented in Romania building upon the experience gained in the pilot projects of Iasi County, where, in 1997, a protocol based on WHO recommendations was developed and implemented 8. After the successful implementation of DOTS in Iasi County, a gradual expansion of DOTS projects was carried out, which, by the end of 2005, covered the whole of Romania. The Romanian programme was based on the DOTS strategy launched by WHO before the Iasi project was created and not on the Stop TB Strategy, which was introduced after the DOTS implementation had been completed in Romania. The results are summarised in figures 1⇓ and 2⇓. The DOTS coverage increased from 4% in 1999 to 11, 34 and 54% in 2000, 2001 and 2003, respectively, i.e. the year in which the national incidence of notified TB cases started to decline. 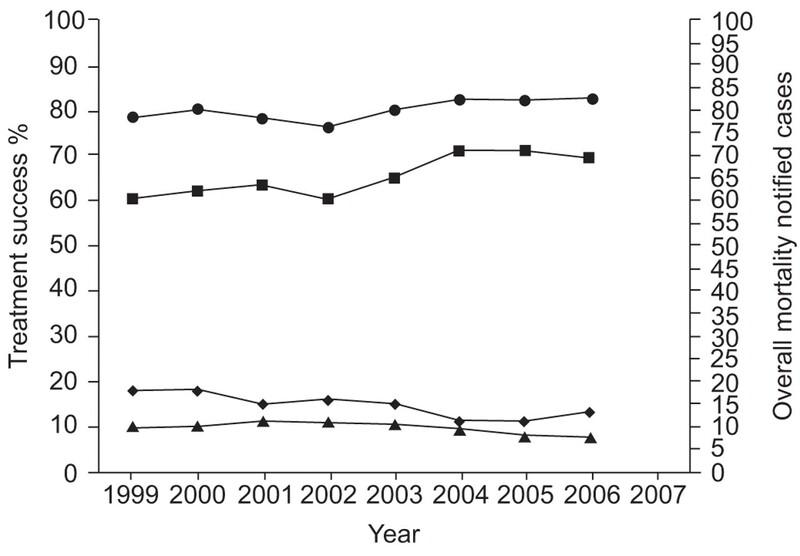 The case-detection rate under the DOTS strategy increased gradually from 46% in 2002 to 75% in 2006 (79% in new SSP-TB) and the treatment success rate increased from 72% in 1997 to 82% in 2006 (85.5% in new culture-positive TB). After reaching the minimum ever rate in 1985 (55.8 per 100,000 population), the overall TB incidence continued to increase reaching the maximum ever rate in 2002 (142.2 per 100,000 population), after which it declined until 2007 (fig. 1⇓). 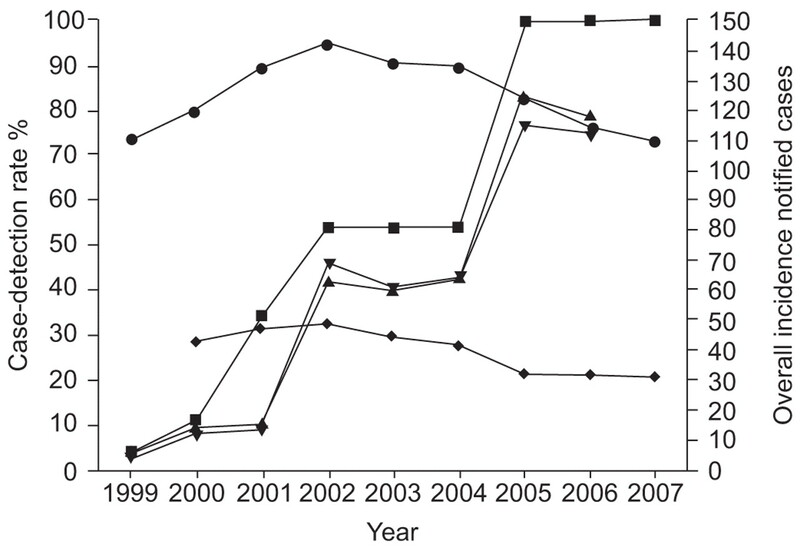 Tuberculosis (TB) notifications (per 100,000 population) and case-detection rate during and following completion of DOTS (directly observed treatment, short-course) expansion, Romania, 1999–2007. ▪: DOTS coverage (%); •: overall TB notification rate; ▾: case-detection rate, all new cases; ▴: case-detection rate, new sputum-smear positive; ♦: TB notification rate in children. Treatment success and tuberculosis (TB) mortality rates (per 100,000 population) during and following completion of DOTS (directly observed treatment, short-course) expansion, Romania, 1999–2007. •: treatment success, new sputum-smear positive; ▪: cured, new sputum-smear positive; ♦: completed, new sputum-smear positive; ▴: overall TB mortality rate. The behaviour of the other related indicators (incidence of newly notified SSP and children per 100,000 population) was similar (fig. 1⇑). After reaching a minimum ever rate of 7.9 per 100,000 population in 1999, the TB case-fatality rate continued to increase reaching the maximum ever rate of 48.2 per 100,000 population in 2002. This then declined consistently until 2007 when it reached 31.1 per 100,000 population (fig. 2⇑). The number of relapses, after reaching a maximum in 2002 (4,418 cases), initiated a consistent decline to reach 4,152 in 2007. The study results suggest that implementation of the WHO-recommended strategy of TB control had an impact in reversing the upward TB trend in Romania, a high-incidence, middle-income European country. In 2006, Romania was the first among the priority European countries to reach the WATs, with a 79% case-detection rate of new SSP-TB cases and an 85.5% success rate in new culture-positive TB cases (cases cured: 71.7%; treatment completed: 13.8%), the indicator on new SSP-TB cases was a little below target at 82.2% (cases cured: 69.1%; treatment completed: 13.1%). The reason for the higher case-detection rate in SSP-TB cases than in all new cases is probably an effect of the extensive training conducted before DOTS implementation, which was funded by the Global Fund against AIDS, Tuberculosis and Malaria. The training emphasised the bacteriological confirmation of TB cases. The main indicators related to the incidence of notified cases, after a typical post-DOTS implementation increase, declined 7 yrs after DOTS expansion was initiated. The decline of the TB case-fatality rate demonstrated the effectiveness of drug treatment. This was further confirmed by the declining number of relapses, reflecting the effectiveness of the treatment component of the programme. The results achieved in Romania, and reported in the present study, are largely based on the DOTS Strategy, as the new WHO approach was only introduced in 2006. As the new WHO Stop TB Strategy implies a more comprehensive approach to TB control, the programme results may improve in Romania in the future given that government and other stakeholders’ commitment will continue at the present level. As a consequence of the extensive public-health implementation of a strategy (Stop TB strategy) the study results are based on the analysis of surveillance (register) data (e.g. without the possibility of further patient follow-up) and comparison of indicators over time (e.g. without the possibility of comparing group versus control cases, as in controlled clinical trials). Further epidemiological research is necessary to understand which factors are responsible for the sub-optimal results of the Stop TB Strategy in other settings. While the role of HIV is a well-known factor responsible for increasing the death rate and lowering success rate, as well as promoting development of TB disease among infected patients and preventing TB programmes to reach WAT, there is still little evidence available on the role of some social determinants of health, such as poverty, malnutrition, diabetes, etc. The success story of Romania suggests that other middle-income, high-incidence countries (e.g. those belonging to the former Soviet Union) might be able to reach the World Health Assembly targets and decrease the burden of tuberculosis, after correctly implementing all elements of the Strategy. Moreover, a coordinated effort of all stakeholders at national level is necessary to tackle the social determinants and to control the HIV pandemic using the available strategies 1–3. This intervention will hopefully contribute to preventing the selection of multidrug-resistant- and extensively drug-resistant-tuberculosis mutants in these “hot spot” settings. Cox HS, Morrow M, Deutschmann PW. Long term efficacy of DOTS regimens for tuberculosis: systematic review. BMJ 2008;336:484–487. Sotgiu G, Arbore AS, Cojocariu V, et al. High risk of tuberculosis in health care workers in Romania. Int J Tuberc Lung Dis 2008;12:606–611. Infuso A, Falzon D. [European surveillance of tuberculosis: description of the network and recent results]. Med Mal Infect 2005;35:264–268. Recombinant human DNase nebulisation in children with cystic fibrosis: before bedtime or after waking up?